Many designs require a connector knowing if a SIM card is present and in position. Although useful, this feature can take up valuable PCB space, says GCT. 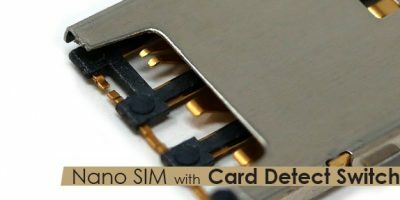 The company’s SIM8055 nano SIM connector has a card detection switch to address this design issue. The connector has one of the smallest footprints available on the market with card detect functionality, claims GCT. This is achieved with a split contact design that consumes no additional PCB real estate. The SIM8055 nano SIM connector has a push-pull ejector type and is in ‘normally open’ switch configuration. The space saving PCB footprint is just 12.2mm in length and 9.54mm in width. Optional locating pegs are also available. GCT supplies standard and custom interconnect products, providing connectors for applications in mobile and wireless communications, computers and peripherals, digital entertainment, networking, industrial, automation, security, medical, instrumentation and consumer electronics. GCT has well-established sales, product development and manufacturing facilities in Europe, Asia and the Americas. We support you wherever you design – wherever you manufacture. With extensive project experience working with design engineers in the product design & development phase, GCT excels in assisting our customers to meet their specific design requirements and specifications. As electronic designs demand higher speed and I/O throughput, smaller form-factor and higher reliability with greater environmental awareness, sourcing the right connector for the right application becomes more difficult and time-consuming. GCT is committed in helping design engineers to reduce product-selection effort by providing expert advice & support in the identification of the correct connectors for the specific application & design needs. With established sales offices in Europe, Americas and Asia, GCT offers speedy local sales service and technical support tailored to its customers. By leveraging worldwide manufacturing resources, GCT believes it offers competitive advantages in recommending good value, compatible interconnect options that will save customers money, lowering the bill of materials and increasing customer competitiveness.